Did Nicki Minaj Really Bust SB Windows Out Of His Car? 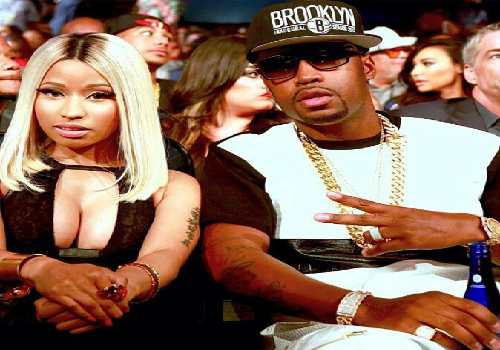 Looks like things with Queen of rap Nicki Minaj and husband Safaree “SB” Samuels just got a whole lot messier. Reportedly the two have been together for 15 years until recently a messy breakup happened. Remember back 3 years ago a 911 phone call was placed and leaked from a hotel by an employee who alleged that Nicki had just got hit in the face by her boyfriend ? Well, now rumor has it that the two were involved in another violent heated argument over the summer. According to TMZ, Nicki and ex husband SB got into a heated augmented that quickly escalated consequently leading Nicki to grabbing a baseball bat and chased SB out the house. Thats when she reportedly destroyed her own 2013 Mercedes Benz that she loaned him before pulling a Waiting To Exhale move throwing his clothes in the garbage. Police were called but no arrest were made since he car was actually Nicki’s, however SB was escorted out of the house. Since the altercation SB has covered up his Nicki tattoos and the two are no longer together. As of now Nicki nor SB has confirmed or denied these allegations.